RED’s upcoming holographic display phone is not a hoax, its the real deal. For those who don’t know, high-end professional grade camera maker RED announced the world’s first holographic display phone – Hydrogen One – a few weeks ago. Skeptics pointed out that the project sounded overly ambitious, kind of like something out of a Kickstarter campaign. You can’t really blame them, since even RED founder Jim Jannard said that the technology is unlike anything right now in the smartphone market. 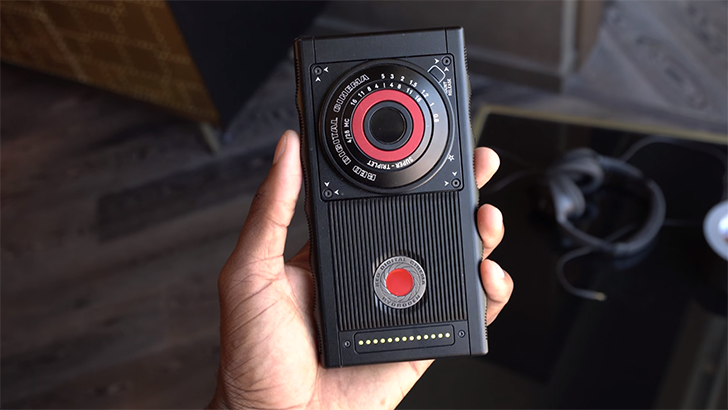 RED showed off three different Hydrogen One prototypes to Youtuber MKBHD, in an effort to dispel skepticism and any other rumors surrounding the device. RED showed off three prototypes for the Hydrogen One (we get to see just two of them in the video). The first “fit-and-finish” prototype is the final look of the phone. This is how RED envisions the release version to look like. This version did not have a working holographic (or 3D for the most part) display. The top and bottom of the phone (from the back) features kevlar for better antenna reception without compromising on ruggedness. The middle features the RED logo, which looks.. unique. What the render doesn’t show is the dual camera setup at the top. Considering that RED is going all out on this phone, dual cameras make sense. At the bottom (on the back), Hydrogen One has contact pins, quite similar to the ones on the Moto Z series. It may get slick camera mods in the future (because RED). On the sides you have these “hills and valleys” or notches to aid your grip and add another unique element to the design. Hydrogen features a flat power button on the right side which doubles up as a fingerprint sensor, similar to Sony’s setup. The volume buttons are on the side, separated by the a “hill”. At the bottom is the 3.5 mm headphone jack and the USB type C port while on the front you have the 5.5 inch display with stereo speakers. The second prototype had a working holographic display, RED didn’t want to show it so all we get to see is Brownlee’s reaction to it. You can switch from 3D to 2D on the display if you feel like it. Meanwhile the third prototype looked more like a camera and less like a smartphone. It had a very large sensor and lens, which RED thinks is the future of mobile photography and video recording. A fully functional prototype of the Hydrogen One will be launched in 30-45 days. Watch this space for more updates on that. we want nvidia tegra in this!